Helping Mamas is an Atlanta, Georgia based nonprofit that functions as a clearinghouse for baby supplies. They collect and distribute a wide variety of supplies including diapers, cribs, clothes, toys, and car seats. 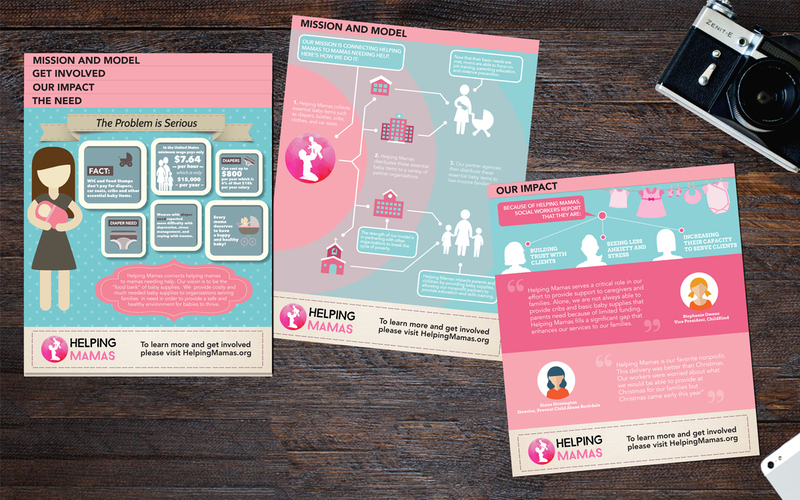 Helping Mamas was in need of a print piece to help them tell their story. Rather than utilizing a traditional brochure, New Frame Creative developed a series of four “stepped sheets” to demonstrate the need, showcase the impact they are having in their community, present volunteer opportunities, and communicate their mission.